Born: 16 January 1936, Washington, D.C., U.S.A.
Married: Benjamin Oakley, 27 June 1957, Montreal, Canada. 1940-1945 Blessed Sacrament School, Washington D.C., U.S.A.
1955-1956 Art Student's League of New York, N.Y., U.S.A. Leading fantasy and portrait artist. Living in Berkhamsted, Herts., UK. See web site for more. 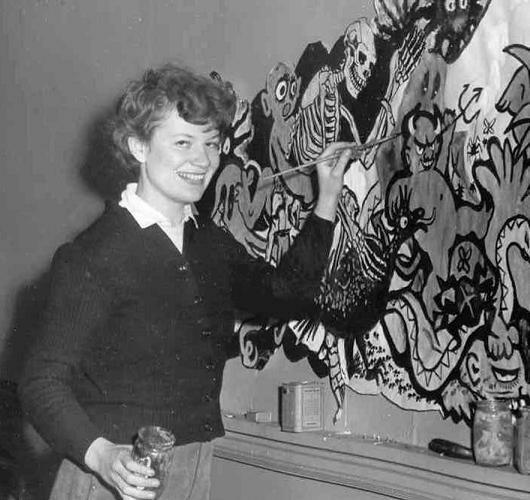 At Art School in Dublin, 1953. She may be older now, but other than that, not a lot has changed - CGO.